As it turns out, I really like Microsoft products on my Apple devices. One of my favorite websites to go and check out however has been killed off as off December 3rd which does not make me too happy. MSNnow was simply excellent and always provided great content without all the annoying political spin. Usually right after I checked out MSNnow I fired up Bing. Yep, I like it a lot actually. Bing search to me is just a richer and better experience. I also enjoy the photo of the day and learning about facts that pertain to it in the 4 boxes randomly placed around the picture that then takes you search results on that topic. 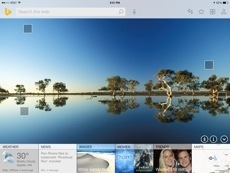 I also liked the scrolling bar at the bottom that takes you to weather, news, images, movies, trends, maps and finance. I especially like the trends as it as a small amount of the topics found on MSNnow. First thing you will notice after updating is the much improved UI to a new iOS 7 theme. I was mentioning above about the image of the day and now you can use it as your wallpaper. There is also improved social media sharing and also saving to your skydive account. Map results have also been improved. Head on over to the App Store for the complete run down of what’s new and exciting about Bing. Give it a shot though, it’s pretty darn good.